Now is the time to prepare for The End of Days. I know there are plenty of skeptics for Armageddon 2012–as predicted and according to the History Channel by the Mayans, Nostradamus and the aliens that have infiltrated our culture–and I have had to convert many of my friends. I would like to now argue why it’s a good thing to imagine the world will end on the Winter Solstice in 2012. First, I’d like to thank the Mayans for so thoughtfully giving us a date in which to look forward. With this date holds the secret to our future good times. And perhaps this is the fatalist in me speaking but let us imagine the two scenarios for that date. 1) The world does not end but, because of the incredible human ability at foresight, end of the world parties last long into the night. Also, 1a) anxiety rises, as time is nigh for our destruction and all those messy things like mortality are briefly considered and once it becomes apparent no such destruction will happen, people are able to REALLY let loose and PAAAAR-TAY! The second scenario is more of a let down. 2) The world really does come to an end, but hell you got to go out having fun. Both scenarios have their caveats, though I see those caveats really as positives (in both cases, drug-induced orgies big enough to make the Greek Satyrs red in the cheeks). 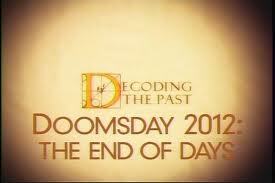 Now, do I really believe that the world will end in 2012? No, certainly not. However the scenario still has an existential appeal to me. Imagine that there is something more plausible threatening humans’ existence on earth. An asteroid, say, whose trajectory is known and by all scientific accounts is on a collision course with our big blue ball, the home planet. Maybe we’re given a few months. How would humans behave on our species’ death bed? It would be the ultimate reveal for Homo Sapien’s essential nature. Are we good? Are we creatures that essentially crave pleasure? Entertainment (in the death bed metaphor, a TV at the end of our bed to keep us occupied)? Does evil exist in all of us? And what of the human reverence for the Grand Abyss, the Grand Canyon for the soul and conscience (this question doesn’t really get an answer but I imagine a person’s opinion on the matter would be told loud into the gargled megaphone of end-of-times discussions)? Our beliefs on how humans would act in that crucial moment before the end says a lot about the individual believer. Many–I have no doubt because it creeps into my mind as well–see the spiral into Bedlam, our evil urges fulfilled because of their lack of consequence. And perhaps, if a majority of the human population believes that, it becomes a self-fulfilling prophecy. But there is nothing stopping our end as a species from being an emotional one. When the world lacks consequences, maybe love is espoused more often, annoyance and grief more often, etc. There are plenty of Hollywood movies that depict the end of days and they are always dramatic. But hell given a few days or weeks maybe we could come to terms with endings, and smile on the eve of our destruction. And thus ends the internet’s shortest discussion on End Time morality. Have a Happy New Year. This entry was posted in The Word and tagged 2012, Abyss, armageddon, end of days, History Channel, Mayans, New Year, PAAAAR-TAY, Satyrs. Bookmark the permalink.